Just posted today by Classic Elite on their website. This little beauty comes in sizes 18 months to 6 years. The one pictured is made with Princess yarn, and because it’s made in one piece (my favorite kind), it requires 2 circular needles, size 5 and 6 (US). The pattern can be downloaded here. What a find in my email this morning! Meet Madge. Today’s Lion Brand newsletter contained this awesome original pattern, designed by the knitter Katy Smith, who writes the Philigry blog. She developed it because she wanted a garment that combined sleeves with the look of a wrap. It can be symmetrical or asymmetrical depending upon where you place the snaps, and she describes it as a rectangle with holes for sleeves. And it looks super in Woolease, an inexpensive yarn that comes in many colors. I use it often and have found that it really holds its shape after many washings. Pattern can be found here . A few tweaks here and there and the classic raglan’s been updated. Worsted weight wool on size 6 and 7 (US) needles, with sizes ranging from small to 2x. I’ve knitted all sorts of sweaters in my time. Cables, side to side, Einstein, oversized, mesh, lace, cardies, pullovers, vests…. You name it, I’ve made at least one. 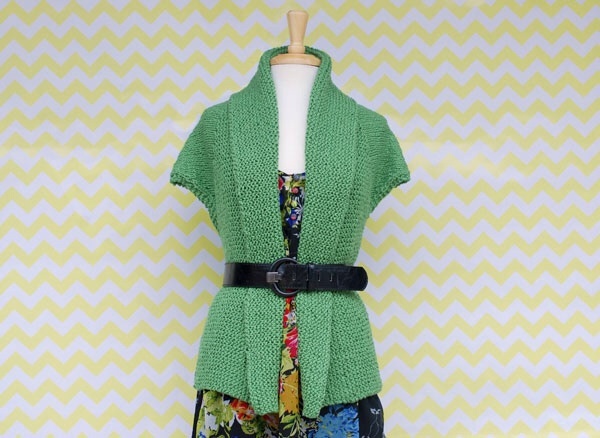 At this point, it takes something a little different to snag my interest, and the Sprout Cardigan, just posted this week by Classic Elite Yarns, fits the bill. Simple, yes, but intriguing in its vertical design. I tend to be skeptical of one piece patterns, as they don’t tend to fit very well, but do tend to sag or slide around. Nevertheless, I’m going to try this one, which looks very manageable. One thing I’ve learned – if you want your sweater to look like the one in the picture, you’d better spring for the featured yarn. Lime green is a fave for me, so my order will go out this weekend. Requires a size 9 US circular needle, 32″. Find the free pattern here . This unusual pattern caught my eye because it features not only vertical cables, which I’m used to knitting, but horizontal ones as well, which I’ve never tried. Until now. Really looking forward to tackling a new knitting challenge. The pattern is available free of charge at the Paton’s yarn website. Very cool. This just up on the Lion Brand website. I don’t usually use thick yarns, but I like the color gradations on this jacket. If I decide to make one, I’ll probably cut the length to about the hip line. Usually unlined jackets bag around the seat when they’re too long. This does look cozy, doesn’t it? And I like the self finished edges without buttons or button holes. Just talked myself into it! Requires three skeins of Homespun Thick and Quick, and a 36 inch circular needle, size 13. First you make the front and the back, then cast on for sleeves. From Lion Brand, where they’re offering tons of free patterns to go with their new Martha Stewart yarn line. This sweater is a plain and simple classic, of the sort that never goes out of style. It should work up fast, on Size 11 (US) needles. Find the pattern right over here.